Sleeping on a cloud? Not quite. 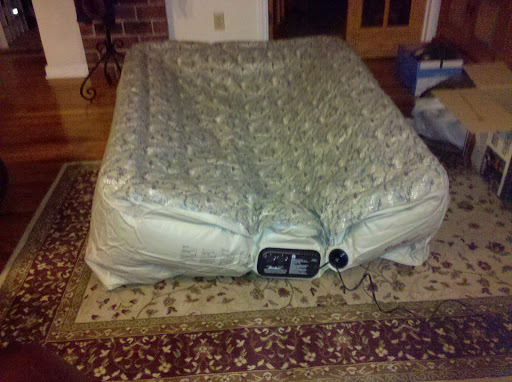 We had the sofa bed hauled away to storage and picked up an air mattress from Target. Work is set to begin next week on the old interior floor and then sanding/refinishing the following week. All furniture MUST be off the floor, hence bye-bye sofa. We consider the air bed to be a temporary solution to the larger issue of the fact that our waterbed has sunk and we need a new schooner. Not sure if we mentioned it before, but our waterbed cracked a joist – you’d think a seventy year old house would hold up better! Once the remodel is complete we’ll begin our search for a new bed.